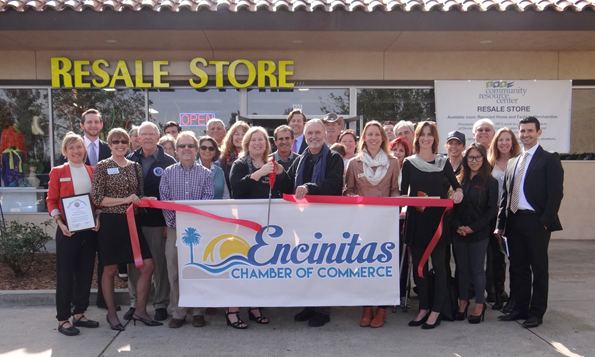 On January 22, 2016, the Community Resource Center (CRC) celebrated the Grand Opening of their new Encinitas location for one of their three Resale Stores (they have locations in Carlsbad and San Marcos as well). All of the proceeds made by the CRC Resale Stores support the infrastructure of CRC’s vital social service programs. Community Resource Center is the major Provider of social services for Encinitas, and has a rich – over 30 year – history serving this community. CRC is dedicated to helping women and children, individuals, and families live safe, self-sufficient lives. They provide critical assistance in the areas of domestic violence services, food programs, and emergency and transitional housing assistance. Check out their new store location on the southwest corner of the intersection of Encinitas Boulevard and El Camino Real, next to Sprouts. Donations are accepted every day, 9:30am – 5:00pm, 7 days a week, and stores are open daily for shopping! Every item you donate and every dollar you spend is certain to be utilized to help give assistance to your neighbors who need it.